detail: Chiharu Shiota, Japan, born 1972, Absence Embodied, 2018, Berlin and Adelaide, red wool, bronze, plaster, dimensions variable; Gift of the Gwinnett family through the Art Gallery of South Australia Foundation 2018, Art Gallery of South Australia, Adelaide, Courtesy the artist and Anna Schwartz Gallery, installation view: Absence Embodied, 2018, Art Gallery of South Australia, Adelaide, photo: Saul Steed. Immersive site-specific commission by Japanese artist Chiharu Shiota. Recognised the world over for her string installations, Japanese artist Chiharu Shiota’s latest site-specific commission embodies the space within the Melrose Wing at the Art Gallery of South Australia. In her conceptually driven practice Shiota attempts to represent what it means to be human. Beginning as autobiographical excavations, her installations draw on personal experiences, emotions and memories to create universally resonant works. Chiharu Shiota's labyrinthine installations weave a complex web from waking life and fading memories. 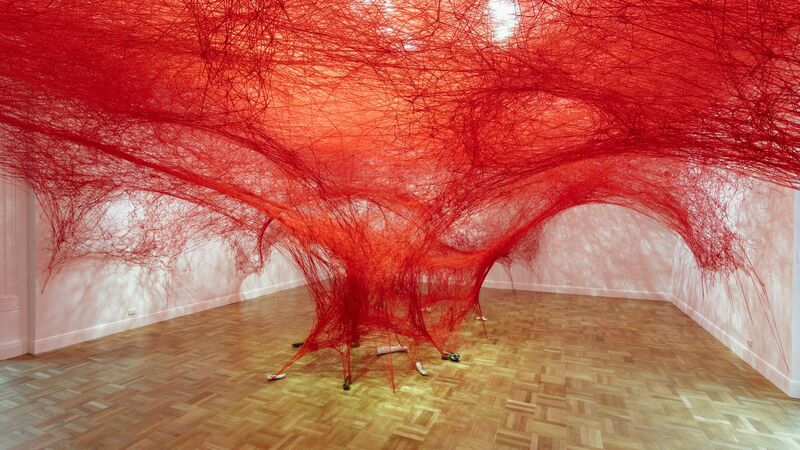 Chiharu Shiota has been generously supported by the Gwinnett family. Presented as part of the OzAsia Festival.